Piran - A place with space and A modern country feel - sitting in perfect harmony within its idyllic setting, this is a home in which to embrace a gentler pace of life. 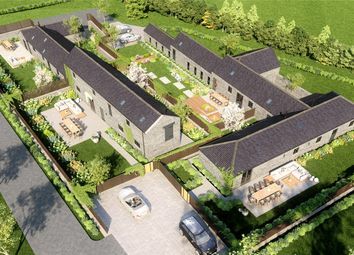 Immersed in beautiful countryside, this will be a stunning truly unique home stone barn conversion within a bespoke development of three other high quality uniquely different homes. Prepare to be impressed when you enter the generous porcelain tiled entrance hallway with double door storage cupboard, doors to cloakroom, and living/dining area and open plan to the kitchen. 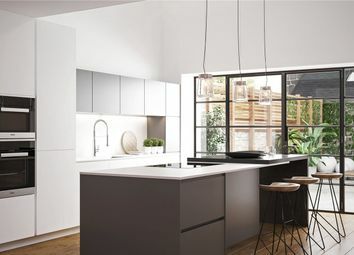 Kitchen/dining: - Guests will be bowled over upon entering the airy character of the double height, large, casual dining kitchen area, delivering an abundance of ceiling space and light . A modern floating tread staircase with glass and wood balustrade leads to the mezzanine study/snug above has a view over the kitchen area adding yet another unexpected element to a property full of surprises because kids will love doing their homework there! In our kitchen designs, a high gloss white finish has been combined with a grey accent colour to produce a fresh, modern look. 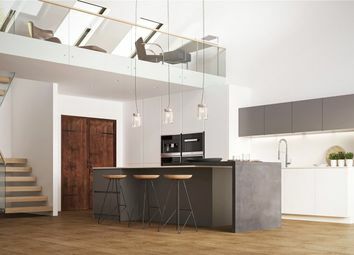 The mood lighting is a special track added to the underside of the worktop and creates the illusion the worktop is floating and choices include stunning glass splashbacks, sumptuous Matte Lacquer, Satin Glass and Veneer finishes. 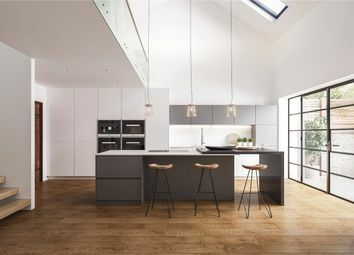 Featuring: Top spec aeg appliances including 2 pyrolytic self-cleaning ovens with steam functions, integrated combination microwave, integrated bean to cup coffee machine, ‘tesla’ induction hob with inbuilt extraction system, integrated dishwasher, a full height larder fridge and full height freezer offering fabulous storage and cooling options. Silestone quartz work surfaces with integrated bin systems, Quooker instant boiling water taps and LED unit lighting for the ultimate cutting edge look. Huge larder cupboards are located at one end of the room and at the other, a whole wall of bi-fold glass doors lead outside to the stunning private inner-courtyard garden, with dining and lounging areas, which makes for an easy entertaining circuit. Living/dining - Enjoy family and friends gatherings in the generously-sized 29ft open-plan living and dining area which offers plenty of entertaining space and defines the concept of modern living. 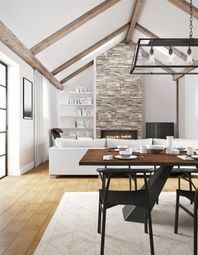 Vaulted ceilings and rustic beams, are just a small reminder of the property's humble beginnings . 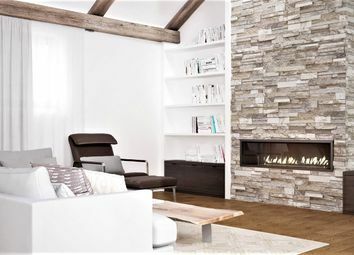 Although the property has underfloor heating throughout, a focal point of the living room is the modern Bio Ethanol fireplace on a stunning split face mosaic natural stone feature wall, and is purely for adding some ambience in winter months. It is eco-friendly and low maintenance with no smell, ash or mess. Built-in shelves provide practical storage space. Double doors to the internal courtyard allow indoor/outdoor living and a welcoming private outdoor entertaining area. The rest of the ground floor encompasses two double bedrooms overlooking the beautiful large courtyard garden. 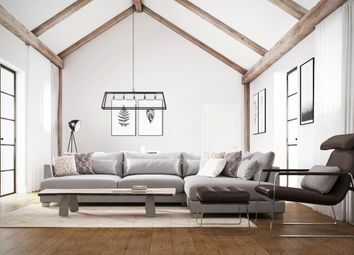 Both airy, light-filled rooms in which to relax, lofty vaulted ceilings with reclaimed wooden beams. The vaulted master bedroom is a place to retreat, reflect and rejuvenate, with the en-suite bathroom merging discreetly with the walk-in wardrobe and bedroom. In the family bathroom, the freestanding bath sets a luxurious tone and offers a peaceful escape from the hectic family life beyond its walls. All bathrooms are fitted throughout with high-end Villeroy & Boch sanitaryware, stylish wall-hung hygienic, rimless, soft close toilets and modern chrome accessories. 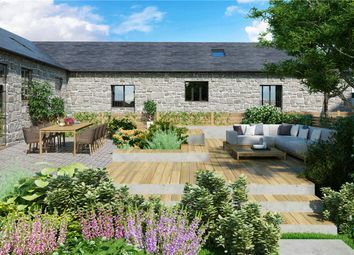 Modern contemporary rustic charm, could become the countryside property watch word, and Pendrea barn conversions are out to prove you really can have city style merged with country charm. The engineered flooring throughout the home ensures that each room flows seamlessly into the next. The under-floor heating allows you the pleasure of warm bare feet. Light painted walls and distressed wood accents enhance the rustic tones of the interior. 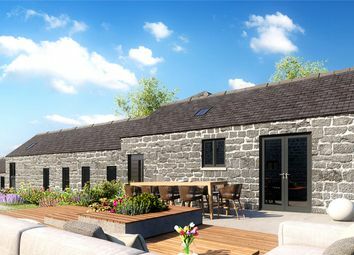 Outside is the largest of the barn gardens and an ideal backdrop for the outdoor living and entertaining areas where the wide-open spaces, create a relaxed vibe. There is parking for 3 cars.